Many large galaxies have an AGN, a small bright central region powered by matter spiralling into a supermassive black hole. When these black holes are vigorously swallowing matter, they are surrounded by hot, rapidly-moving gas known as the "broad-line region" (so-called because the spectral lines from this region are broadened by the rapid motion of the gas). The emission from this gas is one of the best sources of information about the mass of the central black hole and how it is growing. The nature of this gas is however poorly understood; in particular there is less emission than expected from gas moving at certain velocities. The breakdown of simple models has led some astrophysicists to think that many AGNs might have not one but two black holes in them. The new analysis is led by Martin Gaskell, a research associate in astronomy and astrophysics at UCSC. Rather than invoking two black holes, it explains much of the apparent complexity and variability of the emissions from the broad-line region as the results of small clouds of dust that can partially obscure the innermost regions of AGNs. 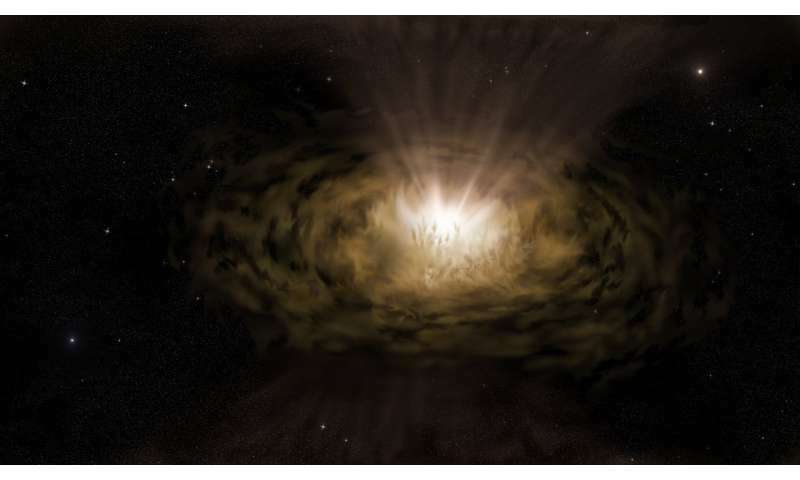 Gaskell comments: "We've shown that a lot of mysterious properties of active galactic nuclei can be explained by these small dusty clouds causing changes in what we see." Co-author Peter Harrington, a UCSC graduate student who began work on the project as an undergraduate, explained that gas spiralling towards a galaxy's central black hole forms a flat "accretion disk," and the superheated gas in the accretion disk emits intense thermal radiation. Some of that light is "reprocessed" (absorbed and re-emitted) by hydrogen and other gases swirling above the accretion disk in the broad-line region. Above and beyond this is a region of dust. "Once the dust crosses a certain threshold it is subjected to the strong radiation from the accretion disk," said Harrington. The authors believe this radiation is so intense that it blows the dust away from the disk, resulting in a clumpy outflow of dust clouds starting at the outer edge of the broad-line region. The effect of the dust clouds on the light emitted is to make the light coming from behind them look fainter and redder, just as the earth's atmosphere makes the sun look fainter and redder at sunset. Gaskell and Harrington developed a computer code to model the effects of these dust clouds on observations of the broad-line region. The two scientists also show that by including dust clouds in their model, it can replicate many features of emission from the broad-line region that have long puzzled astrophysicists. Rather than the gas having a changing, asymmetrical distribution that is hard to explain, the gas is simply in a uniform, symmetric, turbulent disk around the black hole. The apparent asymmetries and changes are due to dust clouds passing in front of the broad-line region and making the regions behind them look fainter and redder. "We think it is a much more natural explanation of the asymmetries and changes than other more exotic theories, such as binary black holes, that have been invoked to explain them," Gaskell said. "Our explanation lets us retain the simplicity of the standard AGN model of matter spiralling onto a single black hole."